If you have ever been on an interstate highway, then you would have noticed that the highway usually includes the main highway, on which the vehicles zoom by at full speed. On either side of the highway, it is common to find a single road, which is often called the service road. The service road is used to give access to private driveways, shops, houses, industries or farms. These service roads are also known as the local-express lanes. The service road and the highway usually run parallel to each other for the entire length. Now imagine this – assume a new highway and service road is being commissioned. The road contractor has stated the work of laying down the highway and service road. At one point, on this new service road, the contractor encounters a small little tree. Now, for whatever reason, the road contractor decides not chop off the tree but instead circumvent it by taking a small deviation from the tree and get back on track to run parallel to the highway. The road gets built this way, and people start using it. What do you make of it? If you think about it – the two roads run parallel to each other, for the entire stretch. At any part, if the highway is inclined, so would the service road. If the highway goes down, so would the service road. If the highway crosses a river, so would the service road. So on and so forth. So for all practical purposes, the two roads ‘behave’ somewhat identically, except at that point where the tree briefly obstructed the path on the service road. I know this is a weird analogy, but if you can somehow imagine this highway, service road, and that tree, and the parallel relationship between them, then you will (hopefully) understand the underlying philosophy of pair trading. So let me attempt to do that. Now, just like the two roads (or entities as we defined them) i.e the highway and service road – think about two companies which are similar, let’s say – HDFC Bank and ICICI Bank. By the way, if you pick up any classic book on Pair Trading, you will come across the example of Coca-Cola and Pepsi. Since they are not listed in India, let’s go ahead with ICICI and HDFC. Given the striking similarities between the two banks, whatever change in the business environment affects one bank, the 2nd bank should be affected in the same way. For example, if RBI increases the interest rates, then both the banks would be affected the same way and likewise when the rates are lowered. Given there is a well-established relationship between the two companies, considering all else equal, if the stock price of entity 1 moves in a certain direction, then the stock price of entity 2 is also expected to make a similar move. If not, then there could be a trading opportunity. For example, all else equal, on a given day, ICICI stock price moves up by X% then given the relationship, HDFC is also expected to move up at least y%, but for whatever reason, assume HDFC stayed flat. Then we can go ahead and claim that ICICI stock price has moved higher than expected when compared to HDFC’s stock price. In the arbitrage world – this translates to buying the cheaper stock i.e HDFC and selling expensive one i.e ICICI. In a nutshell, this is the essence of ‘Pair Trading’. Hang on a second – what about the tree on the service road and its relevance to the whole narration? Well, remember the tree caused the anomaly in an otherwise perfect ‘parallel’ relationship between the two roads? Likewise, in an otherwise perfect relationship between the stock prices of two companies – an event can trigger a price anomaly – where the price of stock 1 can deviate from the price of stock 2. Looking for anomalies in the price behavior. Both these techniques are different and sort of elaborate. I intend to discuss both these techniques in Varsity. Before we close this chapter – a quick note on the history of Pair trading. The first pair trade was executed by Morgan Stanley in the early 80’s by a trader named Gerry Bamberger. Apparently, Gerry discovered the technique and kept it ‘proprietary’ for the longest time, until another trader called Nunzio Tartaglia, again from Morgan Stanley, popularized it. Nunzio, at that time, had a huge following, considering he was one of the pioneers in ‘Quant trading’ on Wall Street. In fact, he led Morgan Stanley’s prop trading desk in the 80’s. DE Shaw, the famed Hedge Fund, adopted this strategy in its initial days. As you may have guessed, pair trading requires you to buy and sell two stock/assets/indices simultaneously. Many familiar with this believe that pair trading is a market neutral strategy. Market neutral, because you are both long and short at the same time. This is grossly wrong, simply because you are essentially long and short on two different stocks. To be market neutral, you need to be – long and short, on the same underlying, at the same time. A good example here is the calendar spread. In a calendar spread, you are long and short on the same underlying expiring on two different dates. Hence, please do not be under the impression that pair trading in market neutral. This is a trading strategy that seeks to take advantage of price differentials between two, related assets. By simultaneously buying and selling the two assets, we are trying to profit from the “relative value” of the two securities. For this reason, I’d like to refer to Pair trading as ‘Relative Value trading’. If you think about this, in its pure sense, this is an arbitrage opportunity – we buy the undervalued security and sell the overvalued security. For this reason, some even call this the Statistical Arbitrage. The measurement of ‘undervalued’ and ‘overvalued’ is always with respect to the one another – and the measurement technique is what we will start learning next chapter onwards. I needed historical and real-time intraday data and was looking at Global Data Feeds with Zerodha’s Partnership. Saw a sample and noticed that it doesn’t contain Implied Volatility figures min by minute. Is Implied Volatility for each stike of stocks required if you want to calculate the Greeks? I don’t think using India VIX’s ticks would be accurate because it is mostly for NIFTY. And even then would be accurate for NIFTY strikes as Volatility Smile can have different rates of increment/decrement? Is there any source where IV can be found? Otherwise can we calculate it? Maybe we will need the whohle orderbook for this and thus a Level 2 quote. Yeah, IVs is a problem. Btw, I should have mentioned this earlier…NSE puts up the IV on the option chain page, maybe you can start with that for time being. However, its not very consistent. Well done Mr.Karthik, I thank you from bottom of my heart for your sincere and effective efforts. Hopefully you would consider my request and i will be waiting for it. MF is certainly on the cards, will try and do that soon. Thanks. Ah, no clean source for IVs, Sujeet. You can calculate it yourself, quite a task considering the math involved. L2 is what you get from the broker – top 5 bid and ask is L2. But the contents are too less about Pair Trading. Advantages and disadvantages should have been included ! The content on Pair traidng is going to spread across multiple chapters, Keval. So don’t worry! Wonderful..Looking ahead for next module. Karthik, What is your personal experience on this strategy? I know, what works for you , may not work for someone else…But just out of curiosity asking! Its been quite good Ravi. There are few challenges though, will write about it as well. Good content but very less content not like option modules :(. Module 9 PDF will take time, Gouse. The next chapter should be up in 2 weeks time. is it true for two stocks who have very high correlation between them? what if they happen to be inn different sectors? how to find such two stocks? Correlation is just one factor. More on this in the coming chapters. sir, but I calculated the daily return correlation between HDFC AND ICICI bank for the last 2 years data…it came at 0.24.
they do not seem to be so correlated.How Can we use these two stocks? Btw, I’d suspect the correlation between them to be much higher. I trade October futures of PNB stock . If I sell PNB futures on 19 October at 130 rate . Means , Now I have sell position. 3500 x 130 =455000 rs. So If stock mover 1 point , I lost my 3500 rs. If stock moves 16 to 17 points , I lost my all money . On 25 October stock opens near 160 , means I lose 30 points , = 3500 x 30 = 105000 rs. There is no chance for broker to close positions at loss of 70 to 80 %. Loss is more than my capital. 1. What shows my screen to me on 25 October ? 2. Can I come into lone ? 3. If I dont left any money , what is happen ? 4. There is chance of court case ? Yes, if it drops 16 points your position will be closed, assuming you don’t have any more funds in your account. Please note, brokers will alert when the position starts making a loss below the exposure margin, inching towards SPAN. Hence they will cut the position if it goes below SPAN. If you’ve made a loss, and you don’t have sufficient funds, then you will have to make your broker good, otherwise, you are liable for a legal action. It is just doubt . Thanks . Cheers. Can Zerodha take legal action If this type of situation is happen ? Yes, in case of a bad debit, the broker can take a legal action. 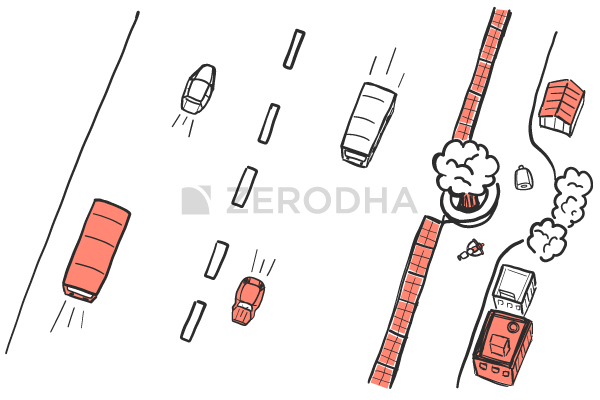 Waiting for this module “Trading System” from ZERODHA!!!! Wil it be different from the other system available in different books? Hi Karthik. I am very much interested by this module. Excited to know which other chapters you are adding to this module. Would like to know more about pair trading, IV spreads, calendar spreads in options. Please throw some light in this sir. The next chapter is about demystifying jargons and few techniques used in Pair Trading. I hope I can speed things up! More insight for pairtrading required..cointegration.. Half-life…hurst exponent…pl cover all the things..including lookback periods of each.componant. thanks and eagerly waiting. Yes sir. All of that and more! 1. how one can find calendar spread of same stock ? Sure Sir, I will. Thanks for the connect! sir what is your opinion on gann and gann theory ? I’ve not use Gann much, so cannot really comment. Request you to wait for few weeks for this, Gulshan. Will have few chapters dedicated to calendar spreads. Point : When an anomaly occurs an opportunity to trade arises –> if the anomoly occures which stockwe need trade, wether we need to trade in changed stock or which remains same. We are adding one chapter at a time, Shiva. Request you to please stay tuned. please inform can we arrange a take profit order in pair trading of any zerodha platform if yes please inform which of your platform offers a take profit order . Not really, you will have to execute these trades separately. In Pair trading Beta of stocks is considered, since direction up or down is same but by what % pair moves, Beta may help here ? Beta certainly helps along with residuals and intercepts. I’ve discussed more on this in the subsequent chapters. I’ve not yet wrapped this module up, Ashish. PDF will be available post that. i want to know about the conceptual theory related to pair trading??? Its explained in the initial few chapters, Santosh. I have found that BNifty and Nifty have strong correlation. Although I have not calculated all details as you mentioned in following chapters, I have used R to do the same job. Also the DATR of BNifty is higher than Nifty but still unsure whether this can be a pair trade idea. Please guide. But it seems intuitive since banks anyway constitute a large chunk of Nifty. It’s intuitive for sure. So let me run the remaining maths. Firstly I wanted to validate the idea from you – experts whether to carry on further studies. I have traded stock futures for a year and found them very risky as volume is less as compared to index. Also I want to check correlation of USD with BNIFTY and NIFTYIT. It might provide more benefit. But only issue is I would prefer to trade on BNIFTY or NIFTYIT than USD (single leg) as currency positions could be heavier and I have never tried currency derivatives. ANy thoughts? Also I want to check correlation of USD with BNIFTY and NIFTYIT. — > this I’m not sure off Narendra. NiftyIT is not tradable, even if it is, liquidity is low and you will take a hit on bid-ask. I did the math as explained in the modules above. I used BNIFTY as independent and Nifty as dependent variable and the logic worked till ADF test. (Found some way to ADF test using residuals – not sure its perfect). (For your ref https://www.quantinsti.com/blog/augmented-dickey-fuller-adf-test-for-a-pairs-trading-strategy). The ADF test result is 8% higher than 5% P-values. So I think I should drop this idea. Yup, ADF should confirm. ADF is the meat of this strategy. Jayesh, yes will do this sometime soon. Can I have a hard copy of all chapters in the University? I can sit and read leisurely, read and re-re read. Make notes. This is not possible when I sit before the computer pl. Priced copy also ok. Help pl? Unfortunately, we dont have a hard copy of this.